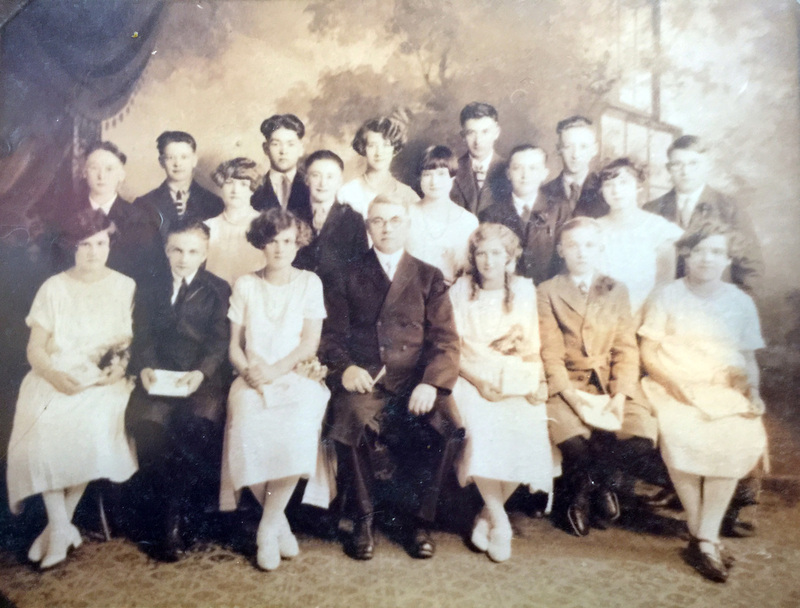 The German Evangelical Congregation Brethren Church Confirmation Class of April 1925. Front row from left to right: ?, ?, ?, Reverend Conrad Wagner, ?, ?, ? Middle row from left to right: ?, ? ?, ?, ?, ? Back row from left to right: ?, ? ?, ?, ?, Alex Wilhelm, Adam Köhler. Unidentified: Katharina Traudt (born in Norka), Emilie Traudt, Maria Fink (born in Norka), Malia Koch, Emilie Krieger (born in Norka), Emilie Aschenbrenner, Elisabeth Michel, Pauline Lehl (born in Norka), Leo Peil (Piel), Peter Helzer (born in Norka). George Deering (born in Norka), Heinrich Hessler, Harry Hohnstein, Robert Seip (Seib), Richart Peil (Piel). Photograph courtesy of Harold Koehler who identified his father, Adam Köhler and Alex Wilhelm. Last updated July 24, 2016.